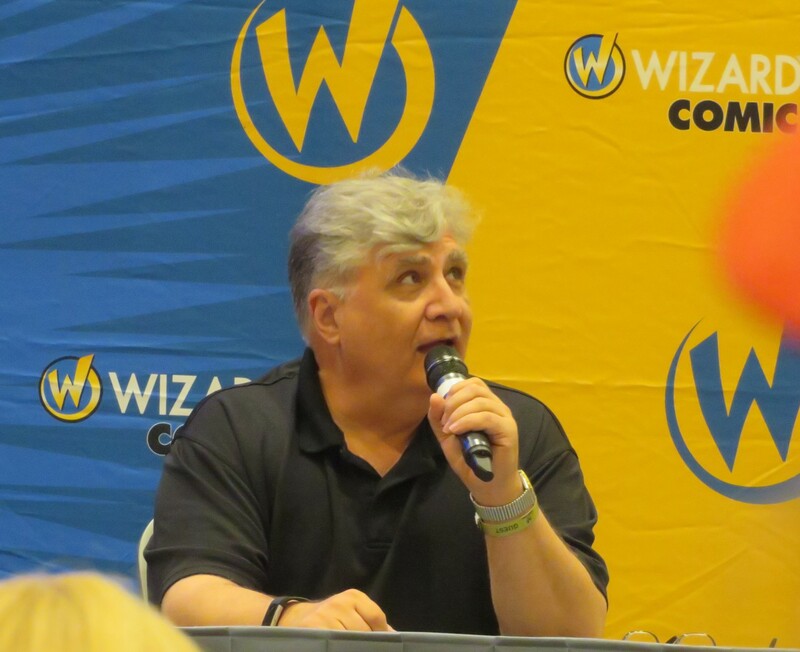 Wizard World Chicago 2018 Photos, Part 5 of 6: Who Else We Met, What Else We Did « Midlife Crisis Crossover! It’s David Krumholtz! You might remember him from such films as The Santa Clause, Serenity, and Addams Family Values, plus the CBS series Numbers! It’s that time again! 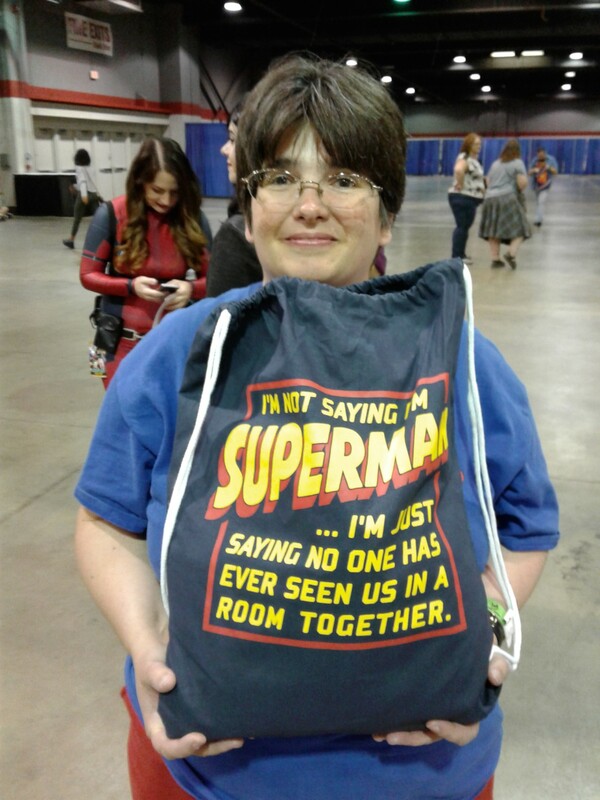 This weekend my wife and I made another journey up to Wizard World Chicago in scenic Rosemont, IL, where we found ample enjoyment and new purchases alongside peers and aficionados of comics and genre entertainment. A few guest cancellations dampened our spirits somewhat, but we persevered and enjoyed our couple’s outing anyway, especially since Anne’s entire weekend admission was free as a consolation prize given to her and a couple thousand other fans after David Tennant’s last-minute cancellation last year. Despite the Saturday morning photo op debacle, we ended up having a lot more fun than expected, in terms of meeting both fine actors met and comics creators I zealously paid in exchange for new reading material. The weeks leading up to the shindig weren’t without their stressful moments. Anne had most been looking forward to meeting TV’s Henry Winkler, a.k.a. Dr. Saperstein from Parks and Recreation, among other acclaimed characters. Despite Anne’s free pass, we weren’t officially committed to WWC till I paid for my own ticket two weeks before showtime. Naturally the Fonz canceled literally two days later. 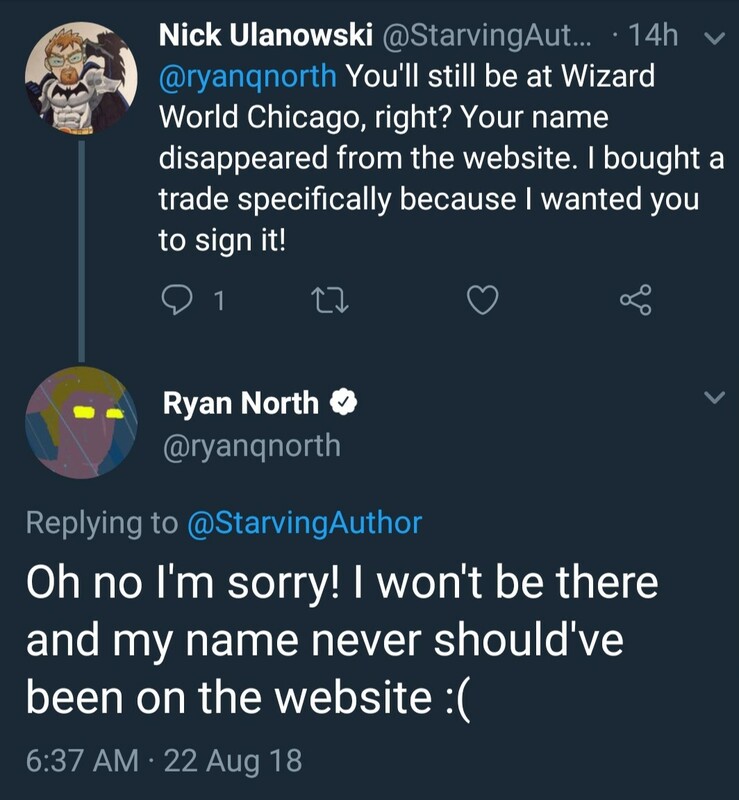 I, in turn, had been hopping up and down in anticipation of meeting comics maker Ryan North, best known for writing the last four years’ worth of Marvel’s amazing colossal Unbeatable Squirrel Girl, plus a short but amusing Jughead arc last year.. A few days before WWC, after months of silence from North on the subject, a curious fan approached him on Twitter, only to be told that he wouldn’t be coming and had submitted cancellation of his appearance to Wizard World before they’d added him to their website in the first place. I took a few hours to compose myself and remember the pros of self-restraint. I realized I had to move on and also try not to think about the part where we would be missing a hometown show, HorrorHound Indy, which changed venue and rescheduled for the same weekend. Simply put, we had to make the most of WWC. Just like a Dear John letter, if John didn’t know he was in a relationship. With no summer action blockbuster A-listers on our meeting agenda for Friday, we had no reason to observe our normal con strategy of arriving hours before the doors opened. We took Anne to a doctor’s appointment (one of those easy “yep, you’re getting better, NEXT!” two-minute wastes of time), drove up from Indianapolis to Chicago sans urgency, stopped for lunch so we could avoid convention center food, got caught in a traffic jam less than a mile from our destination, parked conveniently in the same old garage despite late arrival, and strolled into the exhibit hall shortly after 12 noon. They slapped our ugly weekend wristbands on us, because we didn’t shell out extra for shiny VIP badges or lanyards, and let us go run amok. Throughout the day a handful of actors showed up at their Autograph Area tables reasonably close to the posted appointment times. 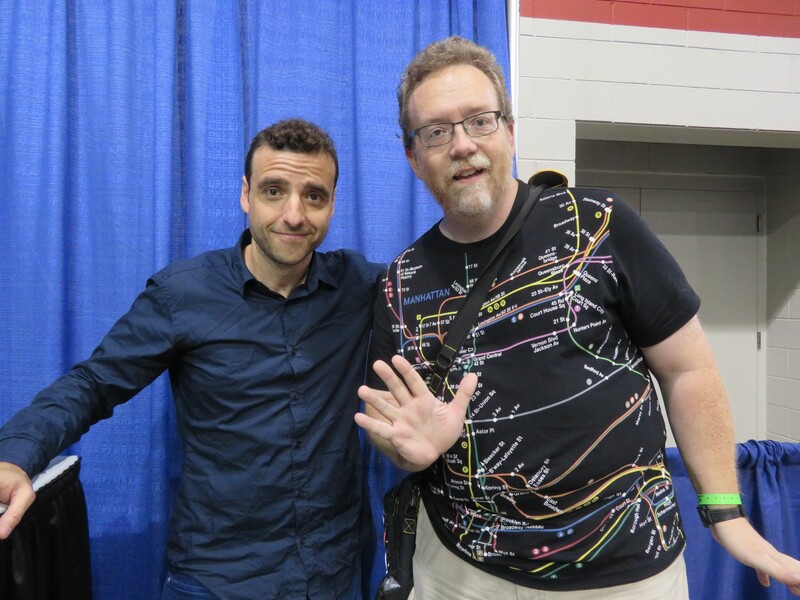 Most of them had short lines, including the first one we met — the afore-pictured David Krumholtz. He popped in shortly before 1:00, only to find his table had no customary 8×10 photos ready for autographing. When we approached, he was negotiating with a Wizard World staffer and brainstorming ideas for characters to go grab from Google Image or wherever. Krumholtz was a friendly gentleman despite this behind-the-scenes housekeeping, and we chatted a bit about Queens and other famous folks who’ve hailed from his old neighborhood. Meanwhile across the way, we noted the early days of the newly established kingdom of Graham McTavish Land. The costar of Outlander, The Hobbit trilogy, and AMC’s Preacher attracted a crowd across the fandoms and had the longest of all the Friday lines I saw. I briefly spotted him later on through the gaps between his constituents. Looks tough, smiles huge. 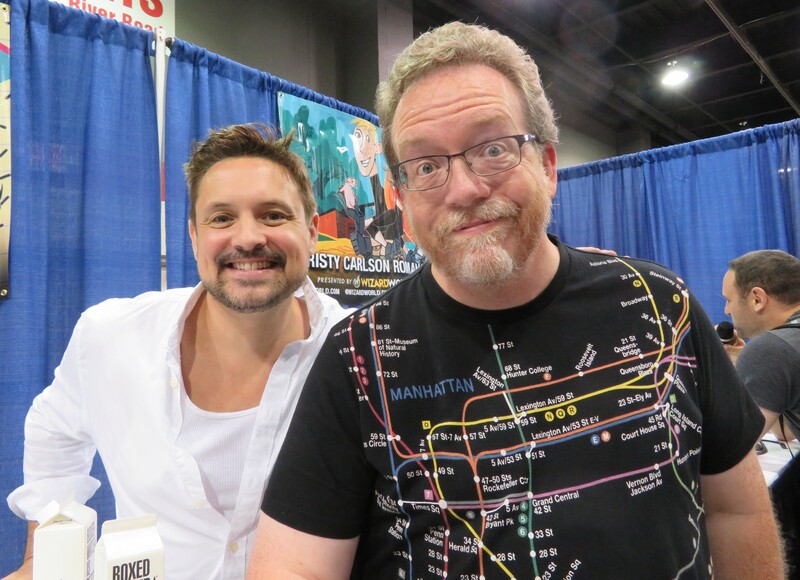 On Thursday I’d accepted another side quest from a coworker who never attends cons and really, really wanted an autograph from Will Friedle, one of four guests in town for a big Boy Meets World reunion. I was given cash in advance, and accepted knowing that we would have time Friday to accommodate as long as Friedle wasn’t as popular as, say, a Stan Lee or a Norman Reedus. As a value-added bonus, I chipped in a few extra bucks for a “combo” package that added a selfie for myself at a fair discount. Win/win, except for the part where the receipt told me nearly 15% of the total purchase price would be going toward taxes. Chicago knows cons are a big business and absolutely wants a piece of the action. Artists Alley vendors at this year’s C2E2 had similar complaints about the cost of doing business in the Windy City. We were roughly eighth or tenth in Friedle’s line at first. Soon after, the volunteer who had been loosely grouping us into a line-shaped order vanished and was never seen again. Soon other fans joined the “line”, which began to diverge in two or more directions. VIPs who were supposed to have first dibs on Friedle’s attention found themselves scattered among us — a few up front and next to each other, some not so much. When our man Will arrived around 2-ish, we realized no one had been keeping track of which fans arrived first or who should move forward in what order. No one wanted to be mean about it, and no one attempted to incite a riot. We all gently surged slightly forward a few inches at a time — first the handful of fans nearest the table, then several VIPs that we were totally fine with letting ahead of us. If we saw a VIP badge, we stepped back. Eventually we got a turn, and it’s to the credit of every single Friedle fan that not a single temper exploded while we were there. We take no responsibility for any happenings after we left, though. Full disclosure: I was never a Boy Meets World fan. I tuned in ages ago for exactly one episode, which appeared to begin with the main cast at school, taking turns making fun of the fat kid in class, because it was funny because he was fat. Nothing about the way it was staged told me this was a very special episode lecturing about the unpleasantness of fat-shaming. I turned the channel and never watched another minute of the show for the rest of my life. On the other hand, in another life Friedle was the voice of Our Hero in Batman Beyond, which my son and I watched together back in the day. Hence the discount selfie. Friedle was in a chipper mood. To the booth on his left, he shouted a greeting to Kim Possible star Christy Carlson Romano, for whom he once acted as animated sidekick. Then he turned his attention toward the three Boy Meets World booths on his right and prepared to flip a rubber band at Rider Strong on the far end, only to demur when he realized he might hit Danielle Fishel, which he determined would be…unwise. He was clearly having a blast. 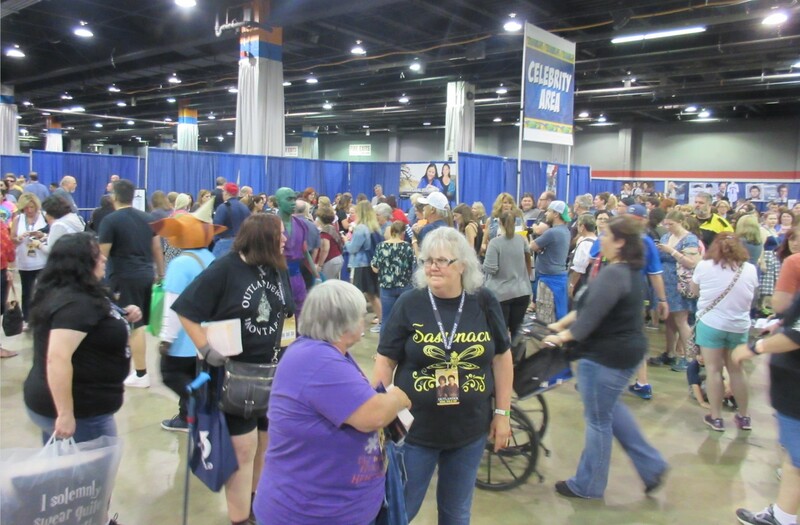 Much of Friday between the autograph lines, and before and after the Violet Ramis Thiel panel, was spent walking as much of the exhibit halls as we could in one day. We saw far more off-topic vendors than I would’ve preferred — sellers of home repair, politics, insurance, so many back pain remedies, and other businesses I would expect to run across and ignore at the state fair, but not on hallowed comic-con ground. 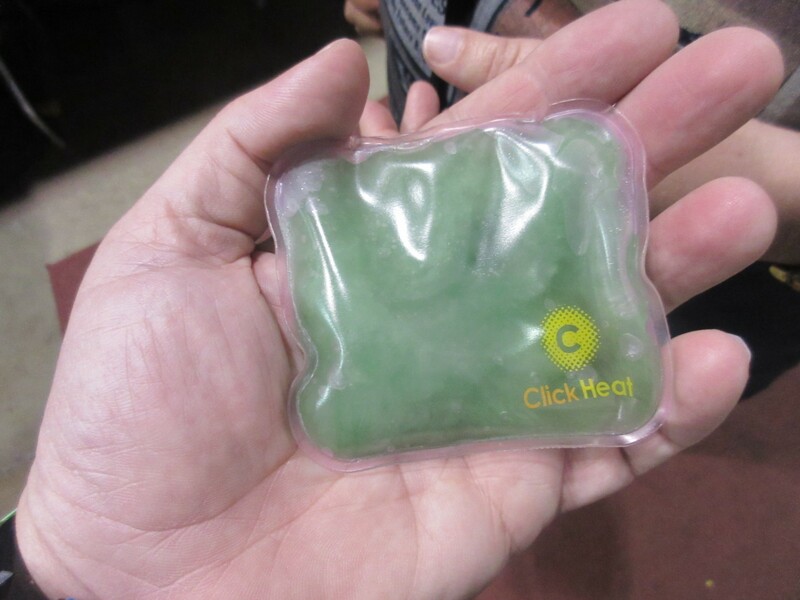 Show of hands, who wants a $100 magical heating pad? Artists Alley felt a bit thin in spots, especially in those far back rows that can be among the loneliest places of all Wizard World. 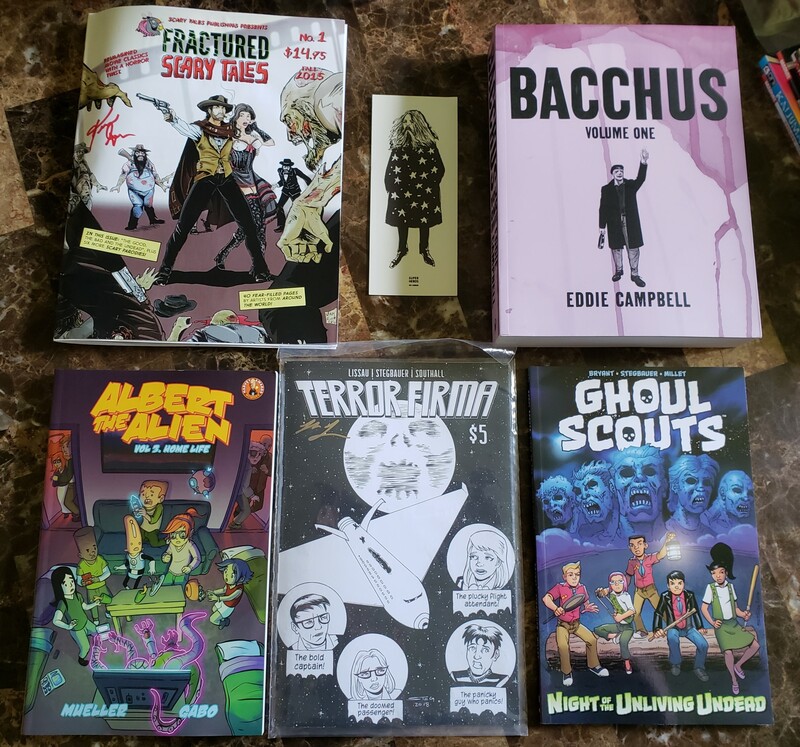 I was happy and lucky to find and buy comics from actual delightful comics makers, including but not limited to old WWC pals Russell Lissau and Trevor Mueller, who each do a fine job of bringing new reading matter every year. (In particular, Mueller’s webcomic Albert the Alien is am award-winning sheer delight.) It was great to catch up with each of them, setting aside the part where we had to dodge around spilled beer in front of Lissau’s booth, courtesy of a drinking fan’s collapsing cup. Thankfully a longtime WW staffer was on top of it within minutes. 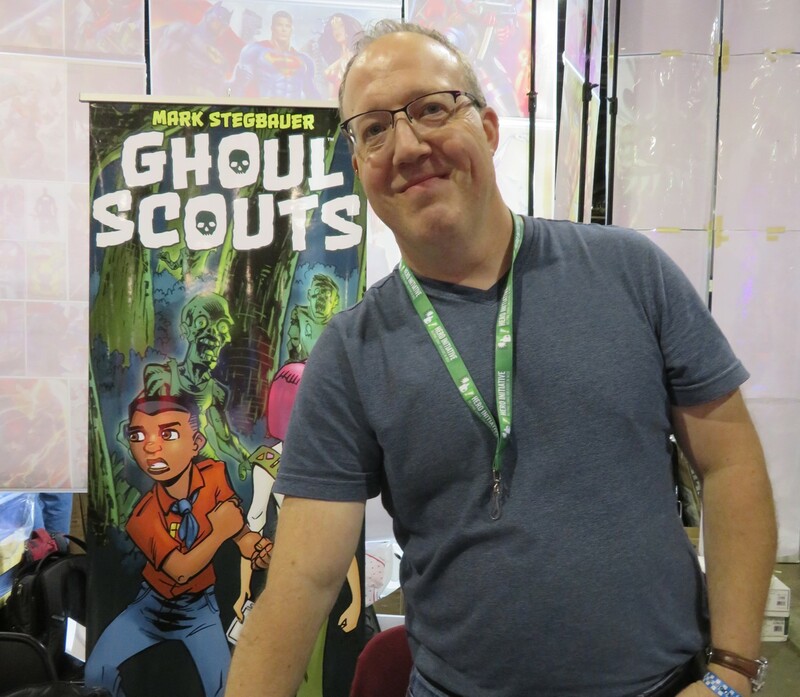 Newly met this year: Mark Stegbauer, a longtime inker for Marvel, DC, and other companies, who presently illustrates the all-ages adventure series Ghoul Scouts for indie publisher Action Lab Entertainment. Recent work includes inking twenty pages in Gregory Graves #1, which I discovered in sampler form on Free Comic Book Day 2018 and had to hunt down when it recently launched for real. Completely new to me was Kevin M. Glover, purveyor of a twisted magazine-sized series called Fractured Scary Tales — basically, short stories about what if famous non-monster movies had monsters added to them. A few tales had exceptional black-and-white art from a number of contributors, and at least one of them ended with a groaner of a punchline that would’ve made Jay Ward proud. 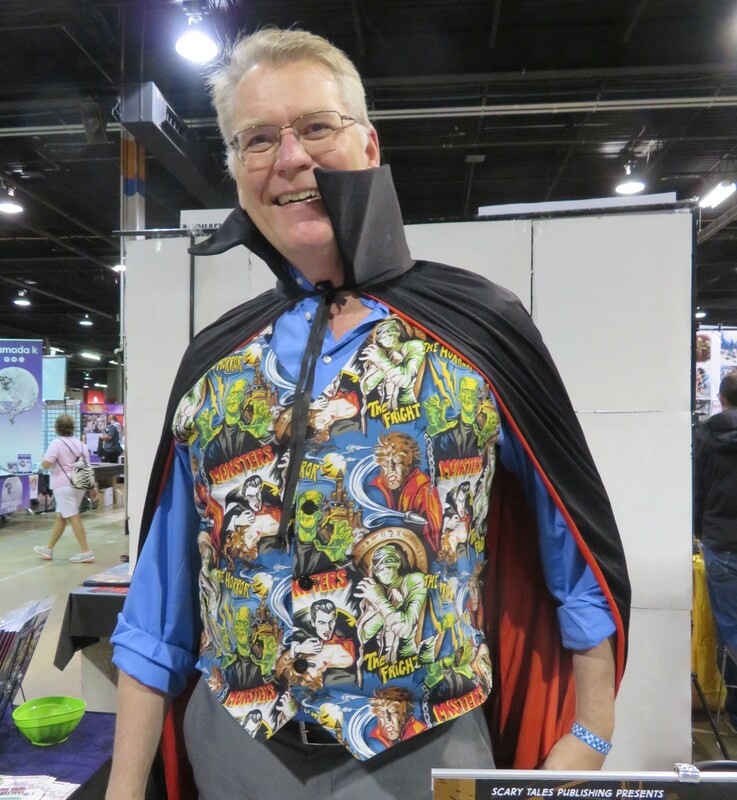 He was a triple threat of sorts: a congenial personality; comics with covers that actually told a story and weren’t just bland character design pages beneath boring one-word titles; and the Best Vest of the Year. 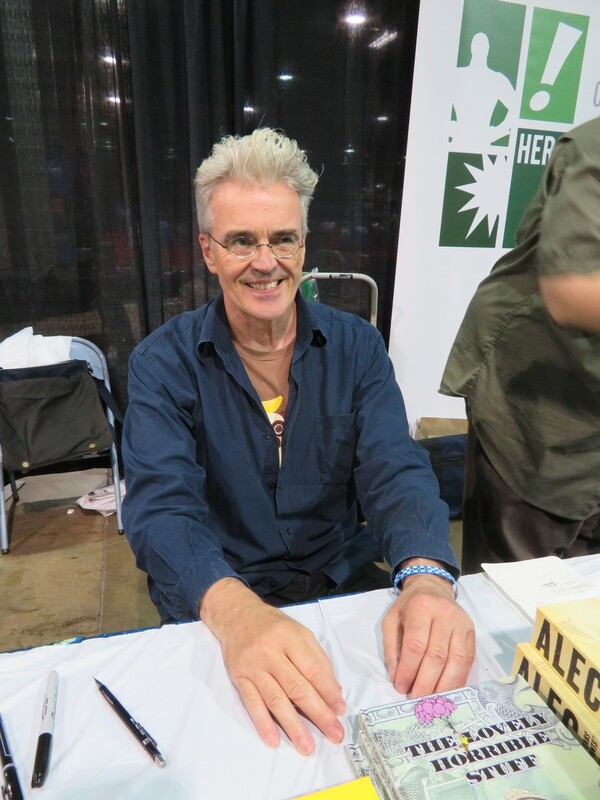 Later in Hall A, I stumbled across one of the biggest names on the WWC comics guest-list: Eddie Campbell! He’s perhaps best known as the co-creator and artist of Alan Moore’s classic Jack the Ripper saga From Hell. That provocative magnum opus was later adapted into a Johnny Depp vehicle that lacked the depth, nuance, and enormity, but at least it got the name out there. Campbell also worked at one point on the John Constantine Hellblazer series for DC/Vertigo, but I first knew him as the creator of an ’80s black-and-white series called Bacchus, in which the notorious Roman party god waxed eloquent in every issue about how Everything You Know about Greco-Roman Mythology Is Wrong. I picked up issues wherever I could find them, which was rare because original publisher Harrier Comics didn’t see much ordering activity from what few comic shops we had in Indianapolis back then. I had similar problems with locating his later Alec graphic novels, of which I have a few but not a complete collection. I may have done a bit of flabbergasted blathering in his presence. Possibly a very large bit. Campbell also handed out free Alan Moore bookmarks and business cards pointing to his latest project, a joint venture with author/wife Audrey Niffenegger. Campbell was signing and sketching on behalf of Hero Initiative, an upstanding nonprofit that helps comics creators in dire need. We’ve stopped and given at their table at past cons, and I was happy to repeat the experience. I also bought one of Top Shelf Publishing’s two Bacchus omnibuses, which weigh half a ton apiece and would’ve destroyed me if I’d found it at high noon and had to march around for six hours straight with so much heavy-duty aesthetically pleasing baggage. New additions to my post-con reading stack. Thankfully we had an excuse to cut our day immediately after acquiring that tome. 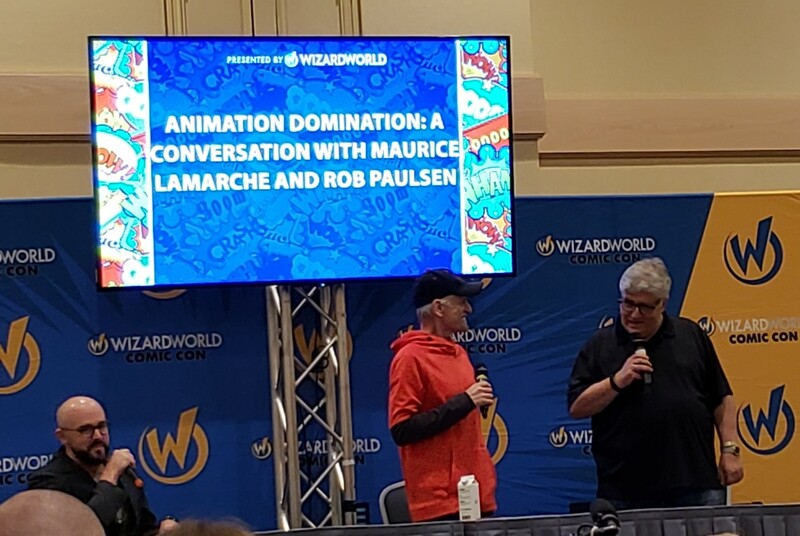 The time neared for our last Friday event: a Q&A with voice actors Maurice LaMarche and Rob Paulsen, best known to cartoon lovers as the geniuses who, along with those mighty animators at The WB, helped bring Pinky and the Brain to life. The men. The myths. The mice. They each have a resumé two miles long, though — unlike countless hopefuls in the field today — neither of them grew up telling themselves, “When I grow up, I wanna be a voice actor!” Paulsen first tried his hand at being an actor-actor, while LaMarche began his career as a stand-up comic with solid impressionist skills. Each of them just so happened to parlay their talents into cartoon side gigs that later became fully bill-paying gigs. We previously met LaMarche at Indiana Comic Con 2016, where he was equally a pleasure. In a rare but extremely welcome moment of Q&A boundaries, they told the audience up front they weren’t interested in any questions beginning with, “Would you do the voice of…?” They refused in advance to record personalized greetings right there in the room, and had to politely shoot down one young fan who attempted to beg for a free autograph in front of a live audience, which rarely goes well in your better-managed cons. My favorite among our Friday photos of Paulsen. Nevertheless, a fun time was had by all, and of course we were treated to multiple voices from each professional as moods, questions, and random inspiration struck. Highlights included LaMarche nearly laughing till he cried at Paulsen’s impression of frequent Match Game guest Foster Brooks, a throwback reference for the ancient among us (present writer included); and LaMarche’s tribute to the powerful debts he owes to Frank Welker, another even bigger legend in their field without whom LaMarche would be in a very different place today. The most thoughtful responses were elicited by a fan asking what they thought about famous Hollywood actors who take animation gigs — and, it was implied, take away roles from awesome folks like themselves who are seen as “just” voice actors. Neither found the notion particularly threatening. Paulsen pointed out some of his own experiences that belied any attempt at generalizing about it. A-list celebs didn’t help The Ant Bully overcome its multiple weaknesses. On the other hand, the original Jimmy Neutron movie cleared $100 million in international box office with a mostly Nickelodeon crew whose biggest name was Martin Short. On the other other hand, an Academy Award-winning actress and the star of TV’s Coach certainly didn’t hamper reception for The Incredibles. Animation has exploded in so many directions, from theaters to eleventy million cable channels to eight zillion streaming services, there’s plenty of voice work to be had somewhere out there for actors with skills and/or work ethic and/or connections. LaMarche was a bit more blunt: “If you have a SAG card, you’re an actor.” He didn’t care about distinguishing or diminishing one actor type over or under another, but added that, if live-action actors can keep crossing over into their animated world for work, wouldn’t it be lovely if voice actors would be allowed to cross over into their TV/movie-award ceremonies and categories. 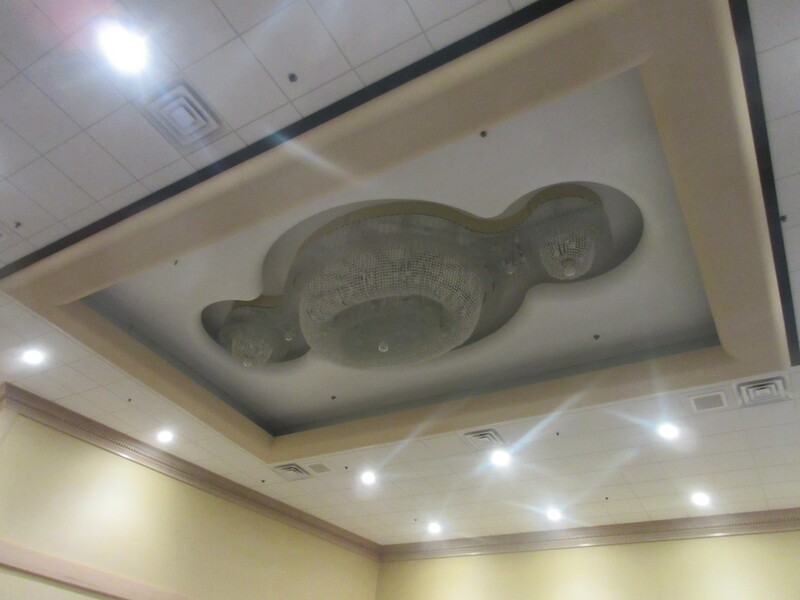 Also, he noticed early on that the chandeliers in the panel room eerily resembled Brain’s head. When the average cartoon character gets an idea, a light bulb pops up over their head. I imagine this is what the Brain sees instead. Thus ended Friday after a few more cosplay photos on our way out the door. Saturday morning, we awoke in Central time but our body clocks were still on Eastern time. Doors would open at 8 a.m.; WWC would resume programming at 10. We had no problem returning to the Stephens Center by 7:30 a.m. to nab spots near the head of the line. We got a near-perfect spot in the big garage and took the Skybridge, across and over the street, toward the first baggage-check area. Security hadn’t even clocked in yet. 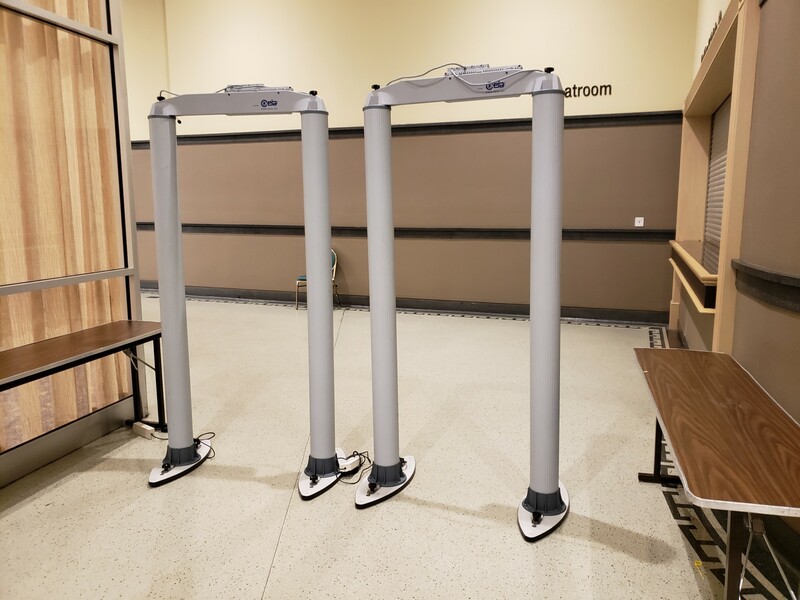 I suppose we could’ve plugged in the metal detectors and warmed them up as a favor. For fun we figured we’d keep walking and see how far we could get before anyone stopped us. If they did stop us, we would’ve understood and complied. We got several hundred feet farther before a pair of locked glass doors halted our journey at a three-way intersection. One (1) fan was there ahead of us. Stragglers joined us, one or two at a time. A few were aware enough to realize we were all gathered for a reason and joined us without protest. More than a few arrivals thought we were all dumb and kept walking past us, only to discover the locked doors and realize we weren’t pesky mallrats loitering for fun. 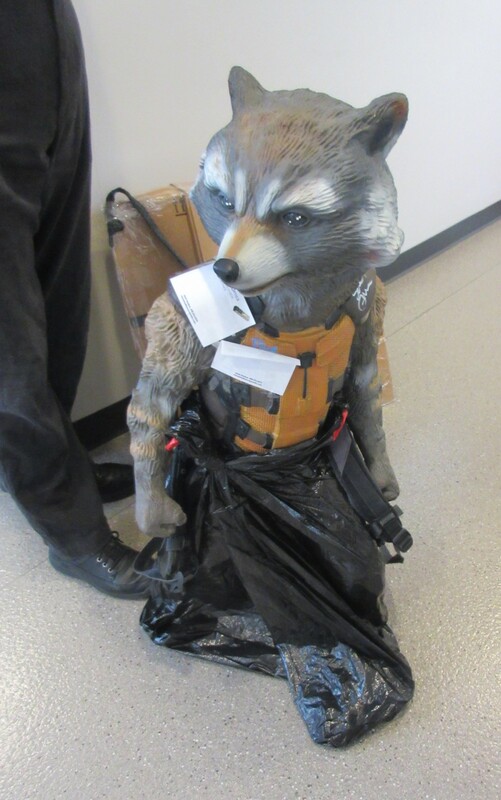 One dedicated fan brought his own way-cool Rocket Raccoon statue for two Guardians of the Galaxy actors to sign. Some fans got impatient and decided to retreat all the way back to the now-faraway parking garage and walk the long length a third time to the ground-level entrances instead. Many of us were stubborn and refused to budge. We’d picked these doors to enter, and we meant to enter them. Somehow. At 8:15 some sort of elderly Rosemont officer showed up with keys, and the day was saved. As a special reward for our patience, security waved us all past and waived our mandatory screenings. But only just this once. Good enough for us. The ground-level doors had indeed opened on schedule, but not too many attendees had beaten us to the waiting lines. The next 100 minutes flew by, mostly in conversation with an older gentleman behind us. 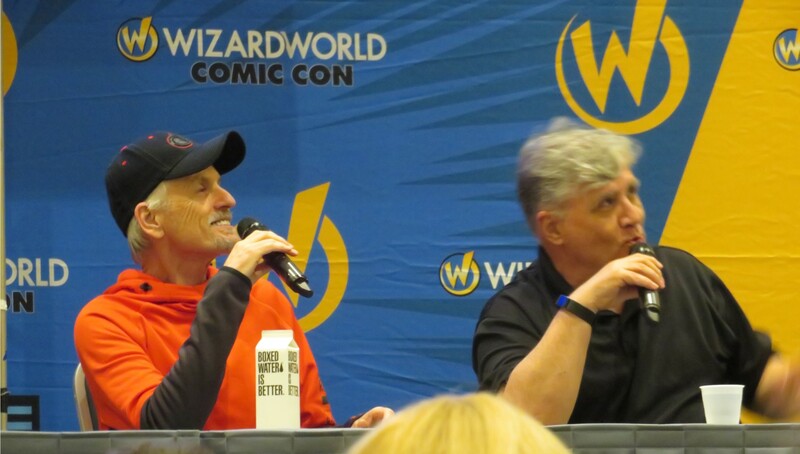 Two different Wizard World reps tried to entertain the crowd at various points, neither of them audible. One had a microphone of sorts that turned every exuberant proclamation into distorted Peanuts-adult babble. With the show’s blessing we non-VIPs entered Hall F a few minutes before 10. We headed straight for Anne’s primary objective: the autograph line for Tom Welling, star of TV’s Smallville, who’s at long last been doing conventions this year. A couple dozen VIPs had beaten us there. One volunteer said they had too many people in line already — partly because they stuck him in a too-tiny space, the same inadequate size as Will Friedle’s — and asked if we could go do a lap around, then maybe try rejoining later. 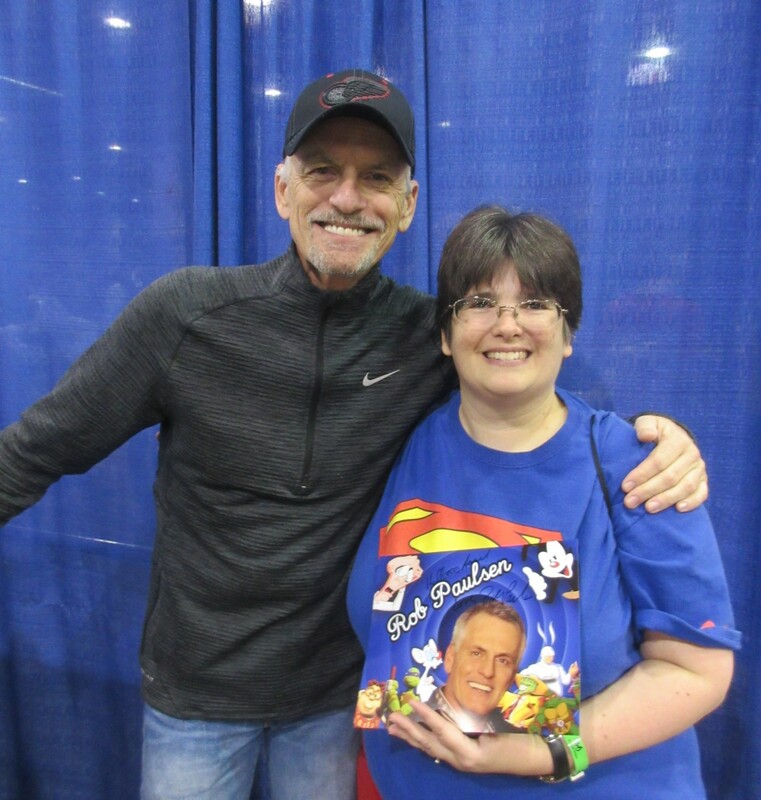 We humored her, skipped across the walkway, and met someone else first: Rob “Pinky” Paulsen! We were second and third in line. Paulsen was scheduled for 10 a.m. sharp but ran a few minutes late. He arrived, shook the hands of us hardy first few, then apologized as he went to go fetch coffee before commencing. Either he was stopped by twenty other fans along the way or Starbucks refused to let a Famous Actor cut in line, but we were content to bide those extra minutes and greet him no less excitedly upon his return. Meanwhile on the other side, Welling was scheduled at 10:30. He arrived at 10:20. He wasn’t the only actor to beat the clock. A few booths down we could see Pom Klementieff also reporting for con duty and defying the odds-makers who thought she’d cancel. After Paulsen, Anne immediately joined Welling’s ever-burgeoning line, while I went and had Worst Photo Op Experience Ever, which we already covered at length. Welling fans were treated to happy moments and speedy service, netting Anne her autograph and exit around 11:05 or so, which is how she beat me to Ivan Reitman’s autograph line. A bit after 12 we returned to the parking garage, dropped off that unwieldy Ghostbusters poster at the car, and grabbed lunch at the hotel next door because we were dead set against eating convention center food if at all possible. I’m proud to boast we kept that resolution for once, though we had to overspend a tad. We had one appointment remaining, a bit more show floor to see, and no more autographs to fetch, either for ourselves or friends. In hindsight we’re relieved we didn’t have to entertain favors from anyone who watches Outlander, because wow, did their entire nation make a fantastic showing for the supporting cast and for author Diana Gabaldon herself. The nation-state of Gabaldonia on Saturday afternoon. Our shopping had its ups and downs. The usually stellar crew at Stylin Online left me hanging and disappointed — every single shirt I asked about, they didn’t have in my size. That stunk. Anne had an awkward moment when her drawstring bag collapsed. I wasn’t sure we could find a replacement among the dealers, but sure enough, fandom found a way. We owe special thanks to the folks at Windy City Workshop, who just so happened to carry a selection of Anne’s favorite kind of convention carryall. And they knew she likes Superman! They’re wizards, they are. 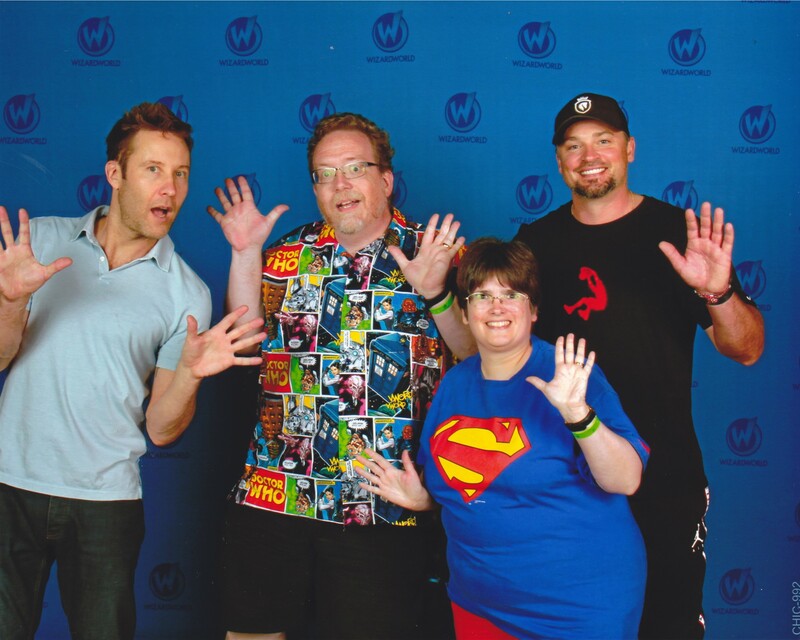 Our final appointment was a 4 p.m. dual photo op with Smallville costars Tom Welling and Michael Rosenbaum. We’d previously met Rosenbaum in Metropolis in 2006 and at WWC 2013, but we’d never gotten a solid photo of him. I had hoped to rectify that oversight. By 3:00 we sighed with relief to find the photo op area’s previous overpopulation issues had mostly subsided, leaving just a couple hundred customers to gather and wait rather than 3-5 times as many. Welling had a solo op scheduled first, followed by the dual. Pre-line lines had been formed in front of the ticket takers — one for the line to get into the solo-op line, and one for the line to get into the dual-op line. The former was twice the size of the latter. Honestly, i was just happy there were actual lines this time instead of mobs, and that we could tell the lines apart. I wasn’t eager to repeat the morning’s misery. The volunteers found a way to make things slightly awkward anyway. Eventually it was our turn to hand over our tickets and get ushered from the pre-line line to the actual line. We walked up to the next available teller. Anne handed over her ticket. Other fans pelted said teller with questions at the same moment. She scanned our ticket, half-answered someone’s question, told Anne “FOUR”, then finished answering the other. Anne didn’t hear her, but I did. I knew we’d all be divided into separate numbered lines, but I didn’t know which numbers corresponded to which designations. All I knew is we were told “FOUR”. We dutifully walked up to line 4 and waited. A few minutes later we realized we didn’t match the other people in line. 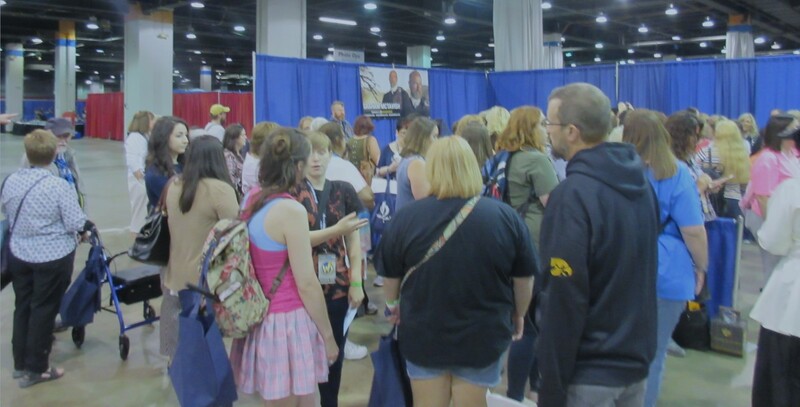 To our right was a line of fans with extra-shiny VIP badges for Welling, Rosenbaum, and/or Smallville in general. To our left was a line of fans with no badges or lanyards, only wristbands like ours. In front of and behind us were fans with VIP badges, whether for other actors or non-specific but nonetheless upgraded VIP status. They’d sent us to the wrong line. The cosplayer in front of us overheard our realization, but said he didn’t care. My regenerating patience was ebbing once again. We rolled our eyes and decided, much as we’d done with morning security, let’s just do as we were told, stay in line 4 where they specifically told us to go, and see how far we get before we’re ordered to relocate. If they did stop us, we would’ve understood and complied. Not long after 4:00, the Gold VIP line moved toward the curtains and their historic rendezvous with Clark Kent and Lex Luthor. We held our breath and waited to get caught and shamed for following bad instructions. Once the Gold VIPs had all moved on, the non-Gold VIP line followed after them. When the line began to crowd in front of the booth, the volunteer overseeing dismissal stopped us until the photographers could catch up. We stood right in front of him, 100% badgeless. It’s not like we were even wearing fake badges, or folding our arms over our chests to obscure imaginary badges. Another senior volunteer walked up to chat with our volunteer for a moment about reshoots that needed to be organized after the Smallville ops were done, due to technology issues with one or more previous ops. It sounded like they had a mess on their hands and needed to make good on some disappointments. The senior volunteer walked away. The photo booth was still a bit congested. Our volunteer turned toward us, the badge-free duo now at the head of the VIP line. Anne expressed her sympathy to the volunteer, one customer service provider to another, about how it’s no fun when things go wrong and it takes enormous energy to fix them and make everyone happy again, or at least satisfy them enough to leave you alone. He sighed a bit, relaxed and began chatting about a relevant experience he’d had in Cleveland to that effect. A minute later, he ushered us and the rest of our line toward the booth. And that’s the story of how we Leverage‘d our way into a photo op from the VIP line and saved ourselves maybe 5-10 minutes of waiting, tops. The good news is we got the photo. The bad news is either the photographer was drunk or the printers were. Technically it’s a better Rosenbaum photo than the last two we took of him, but I have to wonder if the digital copy contained more of his body and didn’t cleave him in twain like the hard copy did. Regardless, mission accomplished. By Saturday 4:30 we’d officially achieved all our goals for Wizard World Chicago 2018. We wandered one last time through the crowded lobby, stuffed with more cosplayers than you can shake a proton pack at, photographed as many as we could till all our energy was depleted, checked another completed convention off our 2018 to-do list, and prayed that we’ll enjoy better photography and line management at our next shows. And if they refuse to let us get away with any benign sneakiness, we’ll understand and comply. Part 1: Marvel and DC Cosplay! Part 3: Last Call for Cosplay! « Wizard World Chicago 2018 Photos, Part 4 of 6: Ghostbusters!